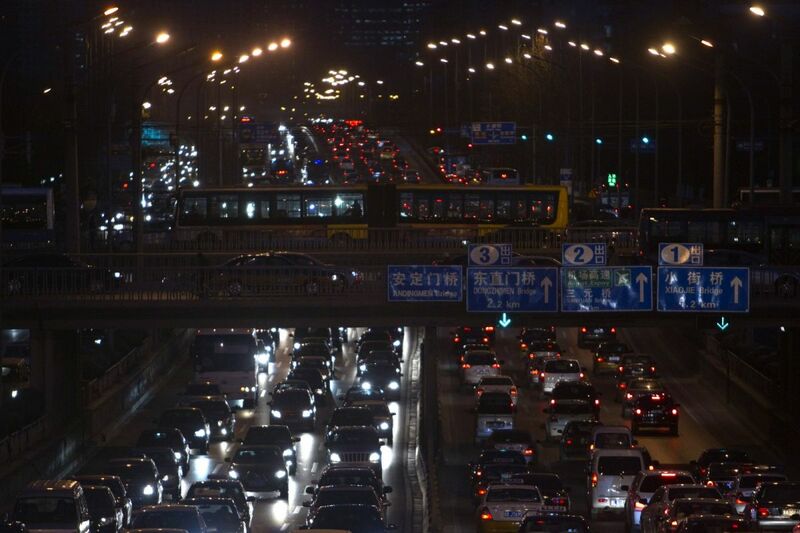 On the 14th day of the eighth month in the Year of the Tiger, Beijing traffic came to a standstill. It was a drizzling evening the day before the 2010 Harvest Moon Festival, the second-biggest holiday on the Chinese calendar, and the city was in a celebratory mood. Colorful lanterns, snarling dragons and paper-mache warriors lined roadside stalls. The 3,000-year-old festival traditionally gives thanks to the moon in hopes of a plentiful harvest. On this evening, however, commuters cared less about the natural bounties. Their concerns were focused on the metal-on-metal gridlock that clogged 140 roads for more than 1,000 kilometers, the equivalent of a traffic jam running from Boston to Philadelphia, then back to Boston again. Even well-worn Chinese commuters had had enough. The month before, the 110 expressway from Inner Mongolia into Beijing had also jammed. Hours turned into days and, by the end, the route was impassable for nearly two weeks. Drivers, many of them truckers avoiding checkpoints on an alternate route, were seen wandering the highway in search of water and cigarettes. Makeshift stands with instant noodles and snacks sprouted up along the stretch of deadlock. Drivers bucket-bathed alongside their vehicles. The traffic jams of 2010 were so mind-bogglingly huge that they seemed to represent some sort of tipping point, the beginning of an era in which congestion now threatened China’s very ability to function. As it happens, 2010 was a milestone — the year of the traffic jam was also the year that the world’s one billionth car hit the road, most likely somewhere in mainland China. It was the year that China’s car sales leapt from the previous year’s by a whopping 27 percent, and the year that Chinese consumers bought half of all the vehicles sold in the entire world. While China’s explosion in car ownership was the most conspicuous, other developing countries were on their own car-buying binges, most notably India, which saw an 8.9 percent rise in car ownership that year. Globally, car sales rose by 3.6 percent, the largest increase in a decade. In 2010, 73.2 million new cars rolled out of dealerships. The dangers of all this motor vehicle growth are obvious. In addition to causing crippling traffic jams, cars are now the world’s fastest-growing source of CO2. A recent study found that transportation in cities accounted for about 2.3 gigatons of CO2 in 2010, almost one-quarter of all urban carbon emissions. If those trend lines hold, cars will soon outpace all other causes of climate change, and like climate change, the world has a certain window of time to stop car growth before it’s too late. Because despite the apocalyptic traffic jams, car ownership in developing countries is still very low. While the U.S. has nearly one car for every person, in China, only one in every 17 people owns a car. In India, it’s one in every 56. That leaves a sobering amount of room for growth. As those countries’ middle classes mushroom, the share of car owners will skyrocket. And once all those people decide to adopt a car-based lifestyle, car-oriented development will be far more difficult to stop. Which is to say, if Asia wants to dodge a future of total gridlock, it needs to find a way to change its trajectory of rapid car growth, and fast. To do this, the continent can look to cities within its own borders. To be sure, certain Asian cities are drowning in private vehicles. But others are battling the onslaught with remarkable success. Japan put the brakes on its initial post-war car boom, realizing early on that with limited space and no domestic oil, mitigating cars was a matter of national importance. Singapore found itself in a similar situation when its residents began growing wealthy in the 1970s and ’80s. Crunched for space, the city-state pioneered the world’s first congestion charge and has managed to keep car use impressively low. With smart regulation, savvy economics and cultural mindset shifts, these cities have proven that economic growth and a burgeoning middle-class needn’t translate into a traffic nightmare. The key is a thoughtful mix of “carrots and sticks”: provide reliable, efficient mass transit, and jack up the cost and hassle of using a car until it’s not worth it. Countries don’t need huge amounts of wealth to create viable alternatives to cars, nor is a low-income population the only thing that can minimize car use. Whether India and China follow the traffic-mitigating leads of Singapore and Japan will have vast implications for how those countries fare in the coming century. Ultramodern Tokyo wasn’t always thus. In the early 20th century, as the U.S. was laying the track for its first subway systems, the Japanese were still relying on horses. In a rush to catch up to the West, the Meiji Era set out to transform the country from an isolated feudal outpost to a modern technological society. During this period, developing new transport methods topped Japan’s to-do list. The country built a network of modern rail and road systems to connect an urbanizing nation. But the Allied bombings of World War II sent the Japanese back in time. By 1945, infrastructure was in such a sorry state that workers were commuting over vast distances on bicycles. Soon after the war, however, the country’s development kicked back into high gear. Led by Prime Minister Hayato Ikeda in the early ’60s, Japan embarked on the fastest modernization effort in the history of the world. 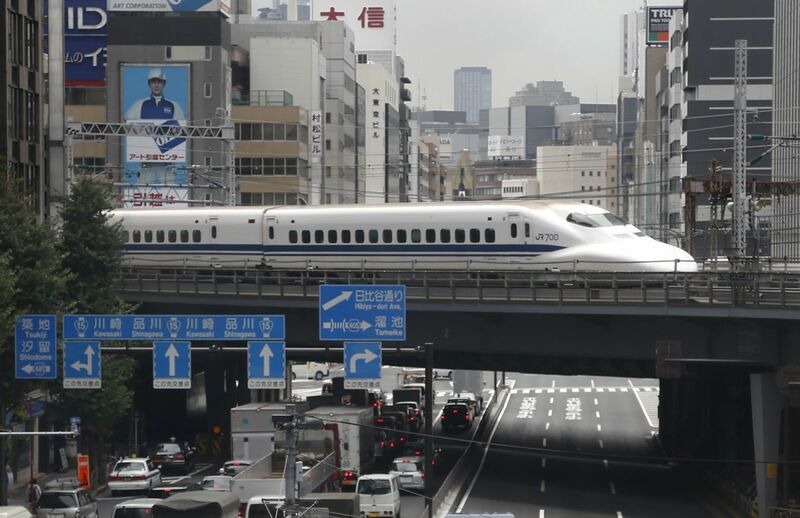 Through innovative public financing schemes and economic policies — including an audacious income-doubling plan — Japan would match and ultimately surpass the transportation achievements of the world’s largest superpowers. The transformation wasn’t just technological, it was cultural. Now, rather than the simple rural life, middle-class Japanese were working to keep up with the Tanakas. Families dreamt of attaining the “three K’s”: kūrā, karā terebi, kā (air conditioner, color television and car). With a newly wealthy population clamoring for the latest manufactured goods, the government saw the most expensive of these goods as the key to unlocking an economic boom. To encourage more people to buy cars, Japan went on a road-building frenzy. Bridges and highways materialized overnight. Gun factories were transformed into automobile plants. In 1956, only 2 percent of the country’s roads were paved. The Japan Highway Public Corporation was formed to change all that. In the 1960s and ’70s, road building absorbed an astounding 40 percent of all public works spending. At the same time, manufacturers and banks introduced extended warranties and auto loans, all of which allowed more and more households to buy a car. But then something unusual happened: The government looked a few decades into the future and realized that encouraging the public’s obsession with cars, while a powerful short-term economic stimulus, was a dangerous and unsustainable plan for a country with no domestic oil and little space to expand. There was also the simple fact that financially strapped post-war Japan just couldn’t afford to sprawl, with suburbs — and all the many layers of infrastructure that accompany them — being too expensive to build and maintain. The 1964 Olympics provided the pivot point toward a major mass transit buildout. The 18th Olympic Games in Tokyo were the first that had ever been held in Asia. It was a huge opportunity to not only invest in a series of massive public works projects, but to gear those projects in a direction that would show the world how far Japan had advanced since losing the war. Japanese and the world alike were dazzled by the sleek, powerful rail system, and rail networks and urban metros became the focus of major investment. While the U.S. was doing everything possible to encourage car culture, Japan began speeding in the opposite direction, making cars more expensive and annoying to use, and pouring piles of money into transit. Today, the country that makes the world’s bestselling car, the Toyota Corolla, has done an outstanding job of discouraging its own residents from driving it. In Japan, you may be able to afford to buy a car, but using it costs a fortune. First, there’s the compulsory 60-point safety inspection, called a shaken, required every two years. The inspection has been in place since 1951, and can set owners back anywhere from $1,000 to $2,000. The exhaustive test inevitably turns up multiple failures, which then cost even more to fix. The shaken also comes with a compulsory insurance and a weight tax. 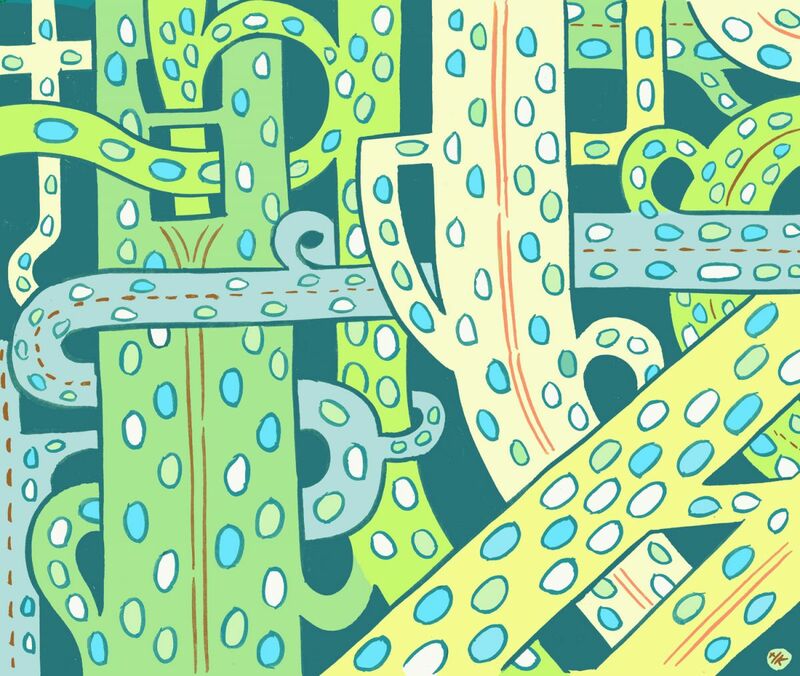 The endless circle of tests, fixes and fees is a perpetual source of grumbling in Japan. Hefty tolls are also a deterrent. Every part of Japan’s highway system is tolled at an average of ¥24.6 (21 cents U.S.) per kilometer, compared to ¥10.8 to ¥13.45 per kilometer in France and ¥7.01 in Italy. Driving America’s vast interstate highway system, by contrast, is mostly free. Bridges in Japan are even more expensive. The Akashi Kaikyo suspension bridge, the longest in the world, charges drivers $25 U.S. to cross. Thanks to measures like these, Japanese drive less than a third as much as Americans do. The average American clocked 14,000 kilometers behind the wheel in 2008. The average Japanese drove just 4,000 kilometers. Heavy taxes and fees on car usage as well as more densely planned cities in Japan have sent the country in a vastly different direction than the car-dependent U.S.
As Singapore’s population swelled, the building of this tropical paradise into a global boomtown began. Companies from around the world made the city-state their headquarters in Southeast Asia. 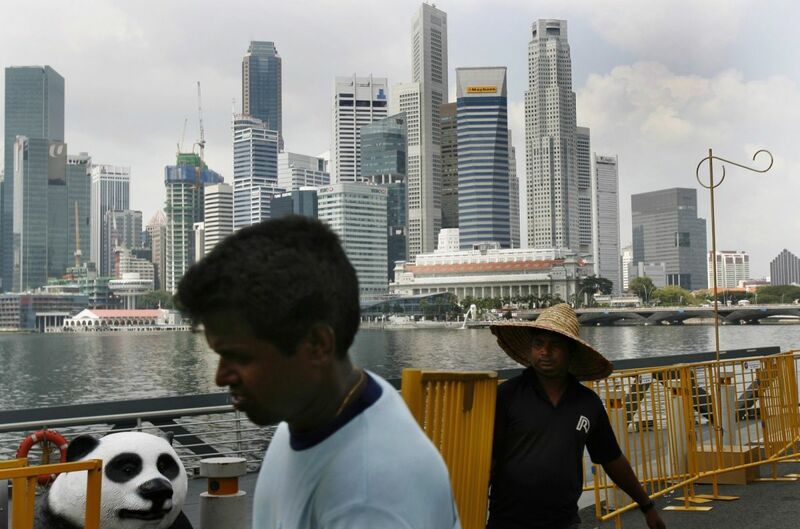 Foreigners have moved there at such high rates that it is now almost 40 percent non-Singaporean. Today, this once-unknown corner of the globe has the world’s seventh-largest GDP per capita — roughly equivalent to Spain’s and Italy’s combined — and more than one in six households are millionaires. But its rise to a world-class city came at a cost. Like post-war Japan, the increase in personal wealth brought with it new consumer desires. As they grew richer, Singaporeans began to buy up cars like crazy. Roads proliferated in the growing business district, and traffic backed up fast, with average driving speeds slowing to 11 miles per hour. The Asian Tiger began to worry that traffic could stall its growth. The government — the same one that fines for not flushing public toilets — decided to implement car-curbing measures, knowing that the policies’ unpopularity would be of a little consequence in a country where dissent is rare. In 1975, Singapore became the first city in the world to implement a congestion charge. Officials cordoned off two square kilometers of the CBD with a fortress of 33 checkpoints. Drivers needed an expensive pass to get through during heavy traffic periods. The impact was instantaneous. Workers started taking buses and carpooling. Early on, cars with three or more people, as well as buses, taxis and motorcycles, were exempt from the fee. Traffic dropped by 45 percent and speeds nearly doubled to 21 miles per hour. The experiment proved successful, and today, the rudimentary Area Licensing Scheme (ALS) has transformed Singapore’s downtown and been modernized over time. Since 1998, the city-state has had in place an Electronic Road Pricing (ERP) system that automatically calculates drivers’ fees according to when and where they choose to drive. Singapore’s successful congestion charge experiment has been copied in city centers from London to Milan to Stockholm. Even Shanghai has taken note and is deliberating implementing road-use fees. And Singapore has continued its trailblazing transport efforts. It even did the unthinkable for municipalities struggling to cover transport development: It offered free rides on the subway. To deal with overcrowding that plagues even Asia’s most sophisticated subway systems, early risers in Singapore can ride for free before 7:45 a.m. The fee-free commute started in June 2013 to help manage overcrowding. Singaporeans looking to save money rose as the sun came up and beat the rush. It’s all part of Singapore’s plan to not only reduce congestion on the roads, but also on crowded transit networks. Rather than pouring money into new lines, the staggered commuting times help maximize usage of existing networks. The plan moved about 7 percent of commuters to off-peak hours. The city has extended the program for another year and hopes that the incentives might be enough to pull some drivers off the roads. 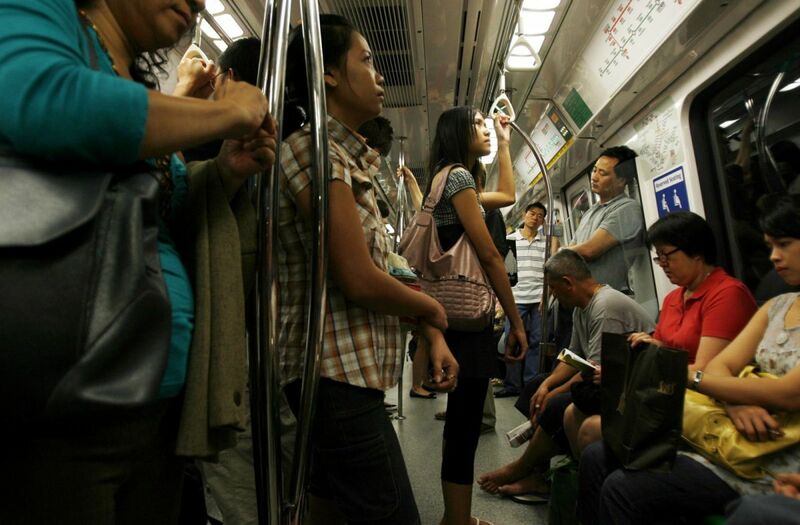 Today, 50 percent of Singaporeans commute to school or work on public transportation. Efficient, clean buses and trains carry passengers on more than six million trips a day — heavy use for a place with just over five million people. It’s not surprising that officials from Shanghai send administrative officers to Singapore on city-planning training trips. If China has learned anything from studying Singapore and Japan, it’s that there’s no silver-bullet solution to saving cities from traffic. You need a buckshot-blast of policies geared toward achieving two basic ends: Make driving harder, and make not driving easier. Like many large-scale disasters, the traffic jams of 2010 sparked a period of national soul-searching in China that’s propelling changes to this day. Not only was the gridlock a major embarrassment, it became clear that congestion was no longer a mere inconvenience to be borne by the citizens — it threatened the country’s economic rise, and therefore must be dealt with. Following the traffic jams, Beijing officials gathered inspiration from cities worldwide and set a goal: It would prioritize sustainable transport and improve air quality to official standards by 2022. By the end of 2010, the Beijing Municipal Committee of Transport (BMCT) had already begun a string of measures to take back the city from an explosion of cars. The most drastic of these initial measures was a quota system. In 2010, 800,000 new motor vehicles were registered, the most ever in any city in the world in a single year. But the buying spree would end there. After the traffic jams, the BMCT announced that in 2011, only 20,000 new license plates would be issued each month, just 240,000 for the entire year. People panicked. Dealerships began to worry about moving their stock, and Chinese buyers rushed to get plates before the lottery went into effect. Not surprisingly, earlier this year, reports began to emerge that a black market had developed where license plates were going for $33,000 — triple the annual salary of an average Beijing worker. For these reasons, in the end, the quota system failed to untangle the problem. It may work better in smaller, emerging Chinese cities where car use hasn’t already skyrocketed. But in the big cities, many people already own a car, and those who don’t are finding ways to get one. Like Singapore, China realized that simply restricting car ownership isn’t enough — it would have to regulate where, when and how those cars are driven. At the same time the BMCT announced the license quota, it also told car commuters from outside the city to get on public transport or stay home. All cars registered outside Beijing were banned from entering the city during peak hours, and within the city, even- and odd-numbered license plates would alternate for road privileges one day a week. These policies have been credited with helping to reduce China’s air particulate matter by 9 percent, chipping away at a problem that requires colossal effort. Beijing is an ideal city for China to begin experimenting with congestion charging. The capital is comprised of a series of ring roads that naturally separate the city into zones, making demarcating the fee areas easy. Experts recommend the city also hike parking fees significantly. Jacking up parking fees was the final policy step mapped out in Beijing’s car-crazy year of 2010. In the Chinese capital, parking now takes up more space per capita (30 to 40 square meters) than the average living space (28 square meters). It’s not surprising, then, that 44 percent of car trips around the city are less than five kilometers — trips that, in a city like Tokyo, would be walked or biked because parking is both expensive and difficult. Mumbaikers know parking problems all too well. The economic capital of India has more than 22,000,000 cars registered in a city with only 3,300,000 parking spaces. Drivers have taken the situation into their own hands by parking wherever they please. The city doled out close to 200,000 tickets for “illegal, haphazard double or angular parking” in just the first half of 2014, outpacing all other traffic violations. What it didn’t hand out tickets for are meters running out, because not a single parking meter exists in Mumbai. Even though real estate prices in the peninsula city’s southern business district are comparable to those in midtown New York, parking lot fees average just a dollar and street parking is essentially free. “This situation reveals in some way the hidden subsidies to car users and congestion in a city with limited road space,” says an article by EMBARQ. Everyone knows that building public transport networks to size takes time. Don’t tell that to China. The country has been pouring money into urban metro lines and bus routes at a pace that few countries can rival. Spurred by the Olympics, Beijing built a massive subway system basically overnight — one that exceeds in size both New York’s and London’s. Guangzhou has (by certain measures) the world’s biggest bike share system. By 2015, the country will have invested $180 billion to triple the size and reach of its subway network in just a five-year span. But making public transport work is about more than just building tracks. It needs transit-oriented development, and short, safe pedestrian routes from stations to destinations. “Proximity is perhaps the strongest determinant of a resident’s likelihood of riding rail transit,” according to one study. That’s one reason Singapore has had such success with its ridership. Ride the subway there, and you’ll be astounded at how easy it is to access — it seems you’re never more than a few steps away from a station. Nearly 40 percent of Singapore’s businesses and 30 percent of its population are within walking distance of transit stations. China realized that shifting people to public transport would require creative coaxing. Low usage is a particular problem in emerging cities, which, says Zhang, are being planned with large-scale, homogenous patterns, making it “extremely costly to deliver public transit to serve evenly distributed residential areas.” Transit Metropolis aims to change all that. The government-led initiative, supported by EMBARQ, has set out to get 40 percent of residents using public transport in 15 pilot cities. The initiative launched in Jinan, a once-idyllic, 4,000-year-old city in China’s eastern Shandong Province. The city’s natural beauty — the hills, springs and mountains — has been memorialized in many poems by the famous Chinese poet Li Bai. Modern Jinan, though, is at risk. The city has doubled in size over the last decade and, as in Japan, Singapore and China’s leading cities, the new development has brought both economic success and a host of problems. Households are buying up cars at a rate the city can’t handle. Nearly 200,000 cars are added to the city’s roads each year, and just 25 percent of residents use public transport. The city’s main transport network, a vast BRT system that stretches along four corridors, is woefully underused. The Transit Metropolis initiative sets out to protect the culturally rich city from being overrun by cars. EMBARQ studied Jinan’s current BRT routes, timings and technology to unravel why residents weren’t using it for regular trips. The city’s natural springs make it difficult to build an underground subway, so it was even more important that Jinan learn how to effectively utilize its bus rapid transit network. Jinan’s transport authority is taking both micro and macro measures to vastly transform service delivery on the city’s BRT. EMBARQ has suggested tweaking traffic signal controls to give buses priority at intersections. The city is also collecting data on passenger preferences and ridership to respond better to residents’ commuting habits. When Nagoya, Japan did a similar exercise to revamp its system, ridership shot up by 70 percent. Jinan is also expanding the BRT’s reach by mapping out new routes, and looking to link up these routes with cycling and walking paths. Including non-motorized transport is a significant step in nations where technology-driven transport innovations are seen as bragging rights. The bicycle, in this context, is often seen as a nuisance or a relic of a different era. In 2011, India’s planning commission representative at the International Transport Forum declared that cycling was a “miniscule thing … not the future.” Luckily, some innovative cities beg to differ. Chennai, India, is one of those. In October, the Chennai Municipal Corporation, the city’s government, announced a policy to flip the hierarchy of street users on its head. Cars would no longer be kings of the road. “Walking and cycling infrastructure — that until recently was at best an afterthought — will now take center stage,” said an announcement by ITDP, which has been working closely with the city on this effort. Chennai has even allocated an incredible 60 percent of its transport budget to improve and expand footpaths, bike-share systems and cycle lanes. The steps taken by Chennai are unprecedented in a country that has been devoting a majority of resources to roads, flyovers, bridges and highways. Still, getting people to make environmentally responsible choices takes some significant coaxing. In September, Beijing called on the help of a cartoon character, Tongxin Doudou, to excite young and old about the benefits of sustainable transport. In a series of videos, the rotund, bespectacled boy takes on issues that Beijing residents grapple with every day: how to avoid traffic jams, help clean the air and increase physical activity. The messages are being projected in 17 subway stations, in public squares, on social media and in buses all over the city. Millions view Tongxin Doudou’s messages every day, and city officials are hoping that awareness campaigns and a reversal of top-down planning will get Beijing commuters to put away their cars. These campaigns continue to battle a vision of globalized, car-connected Asian cities. After the new Indian Prime Minister Narendra Modi announced the country would build 100 smart cities, a video began circulating showing what that future might look like. The fictional city, Dholera, based in Modi’s home state of Gujarat, is eerily empty — not of cars, but of people. Shiny, silver futuristic towers are surrounded by 14-lane highways and waterways with plush boats. BMWs glide down open roadways. Forget bike paths, public transport and a country where people live on a dollar a day, this is a city built around the car and those who can afford it. This car-centric future is one grassroots activists in Delhi are attempting to reverse. In Connaught Place, the capital city’s thoughtfully planned circular business district, yogis have taken over. Six days of the week, the market streets are dominated by whizzing yellow and green auto rickshaws, boys on two-wheelers, delivery trucks and oversized vehicles. Pedestrians are forced on and off busy sidewalks overtaken by jewelry sellers and Kashmiri shawl hawkers. But now, on Sundays, there are rows and rows of yogis in downward facing dog. Delhi is the first of India’s major cities to ban cars on Sundays. The citizen-led movement, known as Raahgiri Day, cuts off motor vehicle traffic for a few hours a week to reclaim the streets for residents. As kids on bikes, moms with strollers and groups of joggers spread across Connaught Place’s carless roads, the city suddenly seems like a new place, one where freedom to move about is not endangered by overtaking vehicles and where the air is free of incessant horn-honking. These hours, activists hope, will extend beyond Sunday morning and inspire a movement that remaps the city for people and designates streets for more than just private vehicles. The hopes of Delhi’s residents are not unattainable. Indian and Chinese cities have an opportunity to lead developing countries in a bold new direction. In Western nations, the automobile is losing the allure it once had. Madrid and Helsinki have declared “war on the car” to create pedestrian-friendly city centers. Even in the U.S., where getting a license was once a teenage rite of passage, fewer and fewer youngsters are driving. And in Asia, cities like Singapore and Tokyo have proven change is possible. Both have, through various policies and cultural shifts, disassociated economic success from car use. Their measures have been tough and not always popular. But building a future of fewer cars that improves the quality of life in developing cities will be one of the keys to saving this overstretched planet in the 21st century. That’s a pay-off even the biggest fee-fighting grumblers would find hard to contest.